Did not look Rockets roster's salary, but occurred to me that Shane Battier might be first on the priority list. Unless Luther Head can play point guard, his role in Rockets is very limited as shooting guard. Might be better off for him to seek another opportunity. -Great game by Tmac, who was great down the stretch, after a slow start. -Luther Head made a couple of clutch 3's down the stretch that helped elevate the Rox in the 4th quarter. 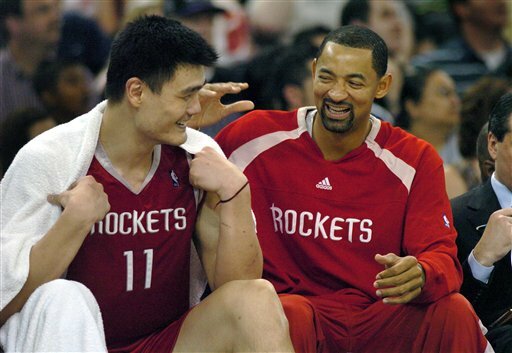 -Yao was efficient in limited time and limited opportunities from the field. -Rafers shoot was off again. -*Yao only got 8 attempts I think. Didn't he get only 4 in the previous game? 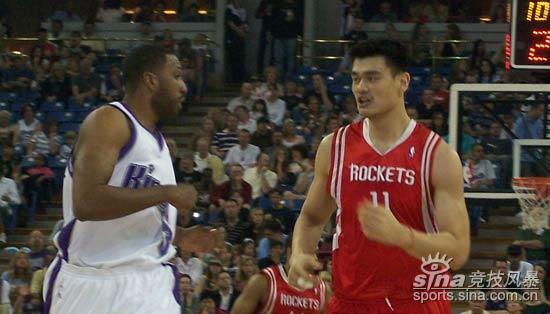 This is a bad sign, as fronting defense pretty much takes Yao out of the game on the offensive end. And even when the Rox try to lob it over to him theres always the help defender there for the immediate double team. 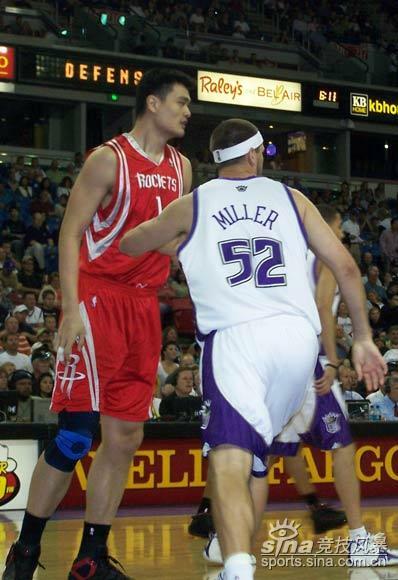 I'm thinking more and more teams will adopt this method, until Rox find SOME way to get Yao the ball effectively. All in all though, I am still just happy to see the Rox win. Keep It Simple, Stupid -- Attack. Rockets 112, Kings 106. After opening the game shooting 1-for-6 on jumpshots, Tracy McGrady lowered his head and drove the ball. By the end of the night, he had lowered the boom on the Kings with 40 points, 10 assists and 8 rebounds. Good things happen when you go to the basket. After playing a passive, dainty first half in which the Kings made 25 trips to the free throw line to just five of their own, the Rockets lowered their heads and forced the ball into the paint. In the second half, the Rockets made 29 trips to the line to just four by the Kings. Did the NBA send in another team of officials to work the second half? Was commissioner David Stern responding to a batch of whining e-mails coming out of Houston? No. Good things happen when you go to the basket. "We didn't need Jeff (Van Gundy) or anybody else to tell us," said McGrady. "We knew we had to stop fouling and we knew we had to attack." There. A simple prescription for keeping the heat on the Utah Jazz in the race for home court advantage in the first round of the playoffs. The aggressor sets the tone. The aggressor gets the calls. The aggressor usually wins. McGrady, more than anyone else in Rockets red, sets the tone with the demeanor of his game on any given night. Indeed, the team missed him greatly over the past two games when he suffered with back pain. But for several games before that, T-Mac had gone passive. He'd been shooting jumpers, mostly. Yes, settling. Even McGrady acknowledges that it's up to him. "We hadn't play well for the last three games and it was up to me to come out and put my will on this game," he said. News flash: It is up to him every night. The Rockets feed off him. Not just his point total, but his style of play. The Rockets took over this game against the Kings because they took over. They made big 3-pointers coming down the stretch and they often got those good looks because they took the ball inside and created opportunities. They hammered the ball toward the hoop, were fouled and got trips to the line that were earned. Hard-earned. Now the Rockets are just one-half game behind Utah. The race is back on. It will stay on if they keep it simple, Stupid. And attack. to Yao Ming on Sunday. Houston Rockets guard Tracy McGrady, left, drives to the basket around Sacramento Kings defender Shareef Abdur-Rahim during the first half of an NBA basketball game in Sacramento, Calif., Sunday, April 8, 2007. SACRAMENTO, Calif. - Tracy McGrady had 40 points, 10 assists and eight rebounds in his return from a back injury, and the Houston Rockets made a late surge to snap a three-game losing streak with a 112-106 victory over the Sacramento Kings on Sunday night. Yao Ming scored 18 points, while Luther Head had 18 and broke a fourth-quarter tie with back-to-back 3-pointers that began a decisive 11-2 run. 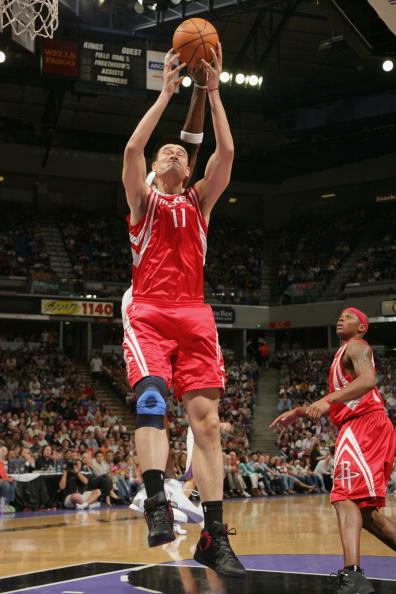 Houston swept its three-game season series with the Kings, including two victories at Arco Arena, despite failing to make a field goal in the final 4:42. Yao and McGrady missed the Rockets' loss to Portland on Friday with back problems, but both returned impressively as Houston pulled within a half-game of the Utah Jazz for the Western Conference's fourth-best record. 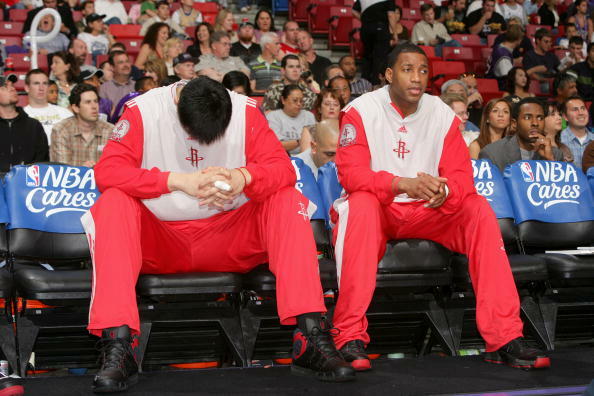 Neither of the Rockets' superstars appeared limited by injury, though Yao spent most of the fourth quarter on the bench. Kevin Martin scored 24 points and Francisco Garcia had 16 for the Kings, who lost for the eighth time in 10 games to practically guarantee the end of their eight-year streak of playoff appearances. After Head hit his difficult back-to-back 3-pointers to quiet the Kings' home crowd, Rafer Alston added another on the Rockets' next possession to put them ahead 98-91. McGrady still hasn't recorded a triple-double in three seasons with the Rockets, but he hit two free throws in the final minute to ensure his first 40-point game since Jan. 16. 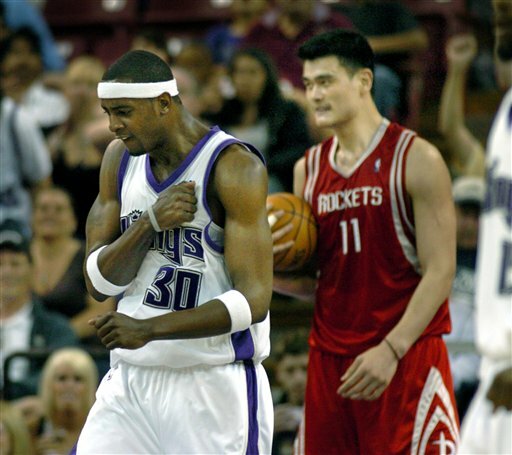 McGrady and Yao scored 16 points apiece in the first half, but Sacramento took a 12-point lead in the second quarter with at least six points apiece from four reserves. Kings coach Eric Musselman continued his expanded use of youngsters Ronnie Price, Justin Williams and Garcia - mostly at the expense of Mike Bibby and Brad Miller. Bibby scored just 11 points, and Miller had four. Houston's Bonzi Wells, who spent last season in Sacramento and was the Kings' best player in their first-round playoff loss to San Antonio, got a mix of cheers and boos when he entered the game in the first quarter. He was injured during the Rockets' first trip to Sacramento in January. Wells botched his free agency last summer when he turned down a long-term, $38.5 million offer from the Kings. Every NBA opening soon filled, and Wells had to settle for a comparatively tiny deal in Houston, where he has flopped. During a quiet moment in the first quarter, a financially inaccurate fan shouted "Thirty-two million, Bonzi!" Martin made his 461st free throw of the season late in the fourth quarter, breaking Otis Thorpe's franchise record for the most in one season since the Kings moved to Sacramento in 1985. Notes: Wells, who went scoreless in four minutes, had been inactive for 18 games before playing in the Rockets' loss to Portland two days earlier. ... Kings F Kenny Thomas missed his third straight game with a broken toe. ... McGrady rolled his right ankle while driving the lane less than 8 minutes into the game. He was down on the court for a long moment, but stayed in the game.